The Armitt is an independent library, museum and art gallery in Ambleside, founded in 1909 by local intellectual Mary Louisa Armitt. In 1997, with the help of substantial funding from the Heritage Lottery Fund, it moved into a purpose-built building on Rydal Road. Its collection explores the history of Ambleside and its people from Roman times until the present day. Highlights include over 400 scientific watercolours by Beatrix Potter, Victorian photographs of the Lake District by Herbert Bell, geological specimens collected by John Ruskin, and paintings and collages by German artist Kurt Schwitters. The library features over 10,000 books related to the Lake District, including 18th and 19th century guide books. The Armitt is situated on Rydal Road just north of Ambleside town centre and Bridge House. It is open daily from 10 am until 5 pm. There is a public car park opposite the museum. Map showing location of Armitt Museum. Check out the photographs of Herbert Bell, a 19th century landscape photographer. 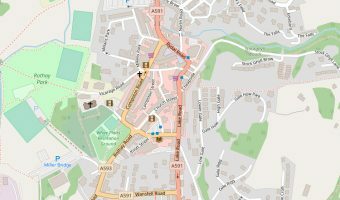 Interactive map of Ambleside showing the precise locations of hotels, tourist attractions, and other points of interest. 5-day weather forecast for Ambleside. View temperature, wind speed and chance of rain.